Embedded vision will be one of the big talking points at the upcoming Vision show in Stuttgart, with many exhibitors displaying embedded products or those for embedded systems. The trade fair will take place from 6 to 8 November. Powerful embedded computing platforms like Arm-based system-on-chips (SOCs) are opening up new ways for deploying vision technology. ‘The Arm-based SoC solutions are becoming increasingly more efficient and can now often achieve parity, especially in terms of their price-performance ratio, compared with X86 architectures which are still predominant in the industry environment,’ commented Gerrit Fischer, head of product market management at Basler. Basler will present an embedded vision development kit at the show, which combines, as a system approach, different components: a Dart camera module with Bcon for a MIPI interface, a Snapdragon 820 Arm processor, and the Pylon camera software suite. ‘Embedded vision systems will probably become established in every industry, but especially in industrial production. Switching manufacturing to new production concepts, which is being stimulated by the basic idea of Industry 4.0, will call for the use of intelligent systems,’ commented Holger Wirth, vice president of R&D automation at Isra Vision. Isra Vision will present an embedded camera for robot guidance and 3D position detection during Vision 2018. The company’s embedded vision systems support standard industrial interfaces based on Ethernet, along with OPC-UA and WLAN. 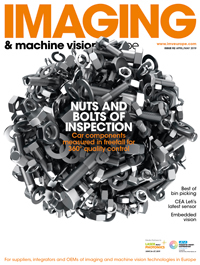 Embedded vision is also expected to open up new applications outside of the factory automation, according to Christoph Wagner, product manager for embedded vision at MVTec Software. He said: ‘Many applications involving larger unit numbers are now being implemented on embedded devices since these devices have many advantages compared with the standard PC variant, for example reduced power consumption, independence of peripherals, and lastly the price and shape factor.’ MVTec will release Halcon 18.11 at the show, which will be compatible with 64-bit Arm platforms. ‘Embedded vision systems show their full potential in Internet of Things environments and networked systems. We see great potential in the areas of home devices and robotics, automotive, retail and surveillance,’ commented Christopher Scheubel, head of IP and business development at Framos. Active Silicon, which recently celebrated its 30th anniversary, will present its vision processing unit, an embedded vision computer which was developed for integration in an industrial or a medical OEM device. The 2018 version of Stemmer Imaging’s software library Common Vision Blox can be ported onto Arm-based platforms running under Linux, which enables PC systems to be changed to new embedded solutions in many applications. Deep learning and hyperspectral imaging are two other trends expected to be seen at Vision 2018.